The Tennessean reports today on the award and ceremony as reproduced below. Three Nashville-area public school principals were among 18 in Tennessee whom an education-focused organization recognized this week for excellence. 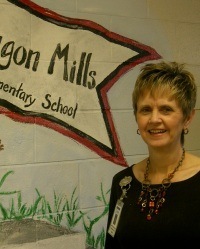 • Mary Lou Del Rio of Paragon Mills Elementary in Metro Nashville. • Brian Bass of Fairview Middle School in Williamson County. • Johnny Chandler of Dickson Middle School in Dickson County. The winners were selected from the more than 1,300 public elementary and middle schools statewide, based on year-to-year gains in reading and math. Schools whose students make the greatest annual achievement gains earn the highest value-added scores. Mrs. Mary Lou Del Rio, an educator with more than 30 years of experience, is the wife of Mr. Luis del Rio, a retired coach, bilingual interpreter, and a prominent Cuban-American in the advisory board of COPLA (Comite de Padres Latinos, the council of Hispanic parents with children in Metro schools).